Ombre became a popular trend on the fashion runways in recent seasons. And since then, this gradient effect has appeared everywhere, from hair styles to cake designs, manicured nails, and even furniture pieces. The word Ombre is derived from the French word ombrer which means to shade and describes when colours gradually fade into each other selected. I particularly love how ombre designs can bring movement and depth into room schemes without overwhelming a space. Even in a mix of bright hues, ombre imparts a serenity into any room scheme, invoking a soothing feeling of rippling water. 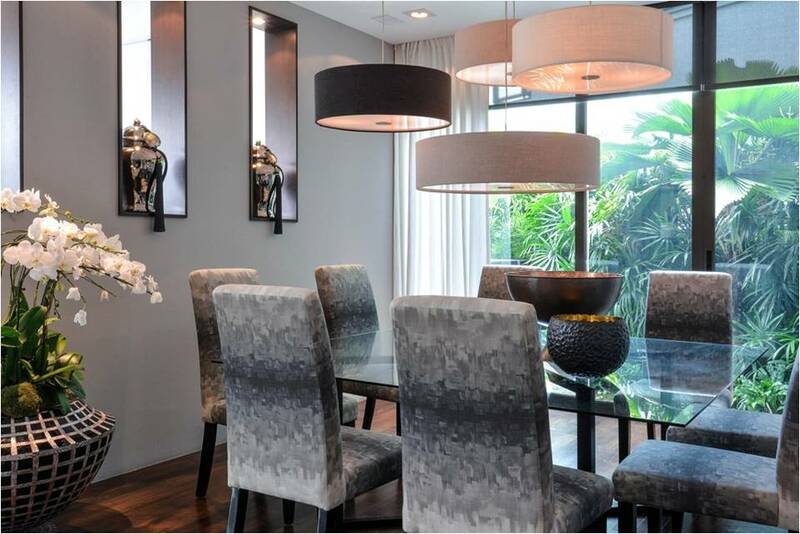 In this dining room, our brief was to create a calm, soothing space. A strong pattern would have been overwhelming here bit the ombre upholstery on these dining chairs, adds vitality to this dining room in a way that a plain fabric could never achieve. Notice the gentle shading of the lampshades to add another subtle layer of detail. In this highly designed room, the ombre curtains are a calming touch; they add tranquility to the room, balancing the strong elements and colours. Here too, we have used the soft ombre tones in the rug to balance the strong mix of colour and pattern. 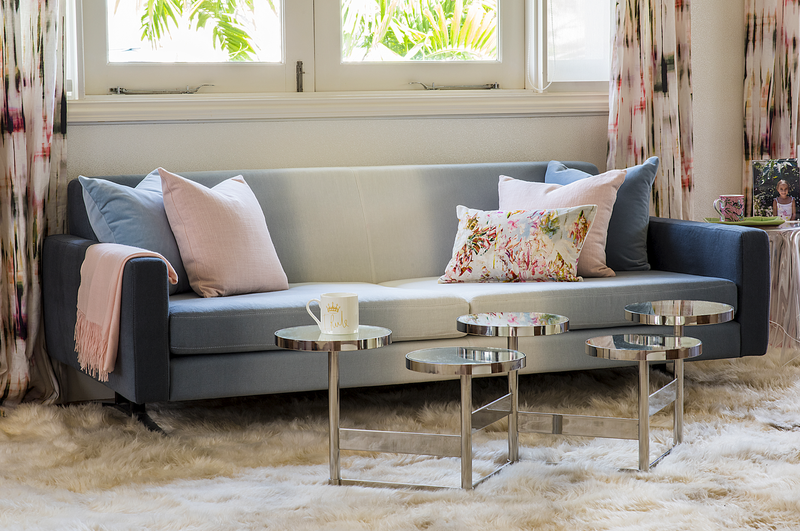 Positioning this ombre sofa next to a window gives the illusion of light streaming in even on the dullest days. 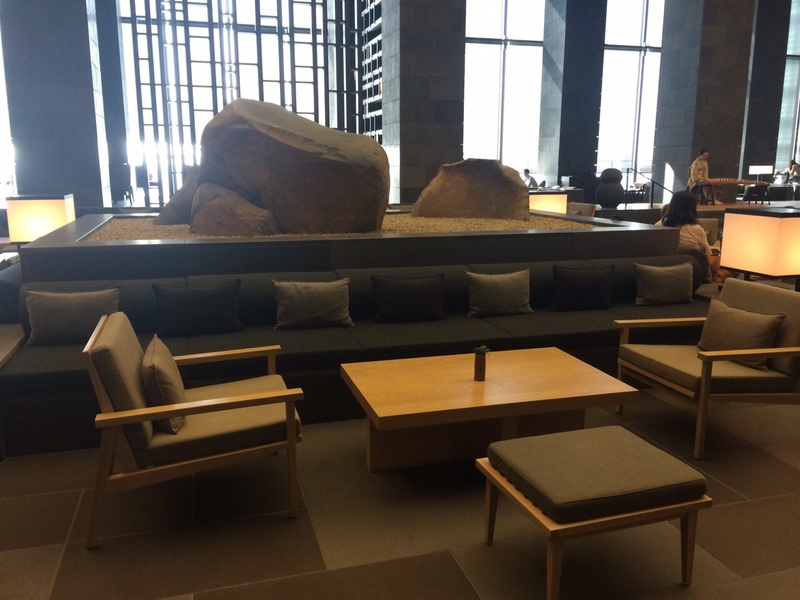 On a recent trip to Nagano for a site meeting for our latest hotel project in the Japanese Alps, I decided to detour and stop for a night in Tokyo to check out the new hotel offering from the Aman group. In theory, the marriage of a Japanese Zen aesthetic and the legendary Aman, understated elegance would be a match made in design heaven so my expectations were high. And it was with eager anticipation that I began my journey into Tokyo. After an early morning start and a 6 hour flight, I took the Narita Express into Tokyo station. By this point, I was tired and looking forward to some good old-fashioned five star pampering. I arrived at the station at the end of the workday to the mayhem that is the world’s busiest train terminals. I approached the information board to check which of the plethora of exits would take me to the Aman and scanned the list of nearby hotels. But where was the listing for the Aman? The hotel had opened in March but, as of yet, had failed to update the Information Directory. So after some fussing and poor attempts in my pigeon Japanese, I found a sweet Japanese lady who was able to direct me to my destination. At last, I was on my way. Wheeling my suitcase behind me, I made my way to the Marunuchi North Exit, and as I left the station, the Marunuchi hotel was right in front of me. I was getting tired now and this chic Tokyo hotel, just ahead, was looking quite appealing. But onwards, the Aman was, supposedly, only another 500m further on and I was sure that the legendary sanctuary of the Aman would regenerate me soon. I plodded on, but where was the hotel? All I could see was a forest of high-rise office towers with no Aman-oasis in sight. After seeking the help of a few kind passersby, I entered the Otemachi Tower. The Aman was meant to be here. 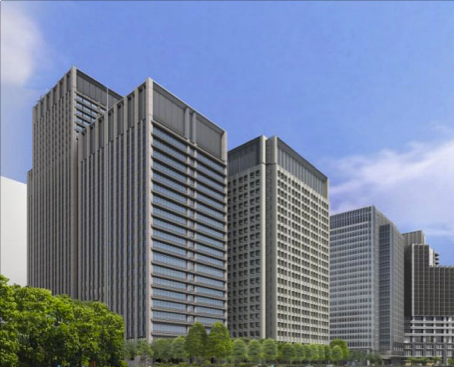 As a frequent visitor to Japan, I am used to Tokyo hotels being set within office buildings. The Aman group, are not known for glitz and glamour, so I was not expecting a grand entrance. However, every great hotel should have some sense of arrival, even more so when the hotel is blended within an office tower. In the design world, first impressions count, understated or not. This entrance should welcome the traveler in from the frenzy of city life. It should represent the promise of the sanctuary within. Yet this entrance was so discreet, it was insignificant! I couldn’t find it! Eventually, I was rescued by a kindly Aman doorman. The Aman hotels are renowned for their service and the Tokyo Aman is no exception. The staff were attentive, perhaps to the point of sycophancy but after my long journey, a touch of obsequiousness was no bad thing. I had had a long day and was looking forward to some serious pampering, Aman style… The bowing and the smiles were welcome. I took the warm towel and welcome drink with appreciation. I had reached the Aman oasis: let the indulgence begin! But as the lift opened to the lobby level, I was hit by a boulder of disappointment. There was no sense of Aman harmony in this monolithic hall. The dark grey clad granite walls may have been cool and calming in a South East Asian resort, softened by lush tropical green vegetation. But here, in downtown Tokyo, they did nothing to moderate the architecture of what was basically a corporate tower. This lobby was undoubtedly striking, but in a hard, oppressive way. There was certainly a commanding grandeur in the soaring ceilings, but there was no warmth to the design. There was a pervading sense of strength but it was intimidating rather than reassuring. It was not welcoming or inviting in any way. The word “Aman” means peace and over the years, the Aman group has developed a fan base of travelers (this designer included), loyal admirers of the unique blend of tranquility, harmony and local aesthetic that Aman design team successfully capture in each property. But this time, I didn’t feel an Aman sense of peace wash over me as I entered the space. Instead, it felt as if armed guards would appear from behind the imposing columns to march me to my chambers. The design was cold and confused, with elements of South East Asia, blended with feeble attempts to capture a Japanese aesthetic. If this interior could be trans-placed into Ankor Wat, I would be cooing and ahhing with delight. But here, amidst the urban sprawl that is Tokyo and on top of a high-rise office tower, the design simply didn’t work. How utterly disappointing! The Aman designers, famous for creating some of the world’s most tranquil retreats, had failed to create an oasis of calm in the midst of the world’s most populous city. The best Japanese interiors have an understated luxury to them which invokes a sense of calm, the Japanese call it Seijaku. Well there was lots of understatement here, but I could not find the luxury. In their attempt to achieve a Zen simplicity, the Aman design team, had opted for simple furniture forms. But the grey polyester upholstery and light wood framing resembled something that would fit right into a Muji furniture catalogue. But once I had escaped the lobby and the hotel corridors, the rooms themselves were lovely. 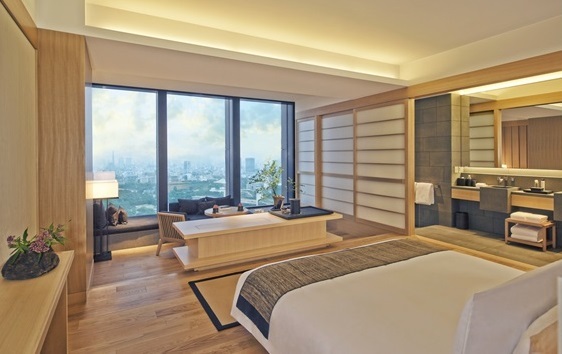 Expansive, not just by Tokyo standards, these were thoughtfully designed with a harmonious blend of Kyoto ryokan style and contemporary urban calm. The attention to detail, that I expect from the Aman group was evident in spades along with the softest hotel bathrobe I have ever tried. This room was no less than I had hoped for. 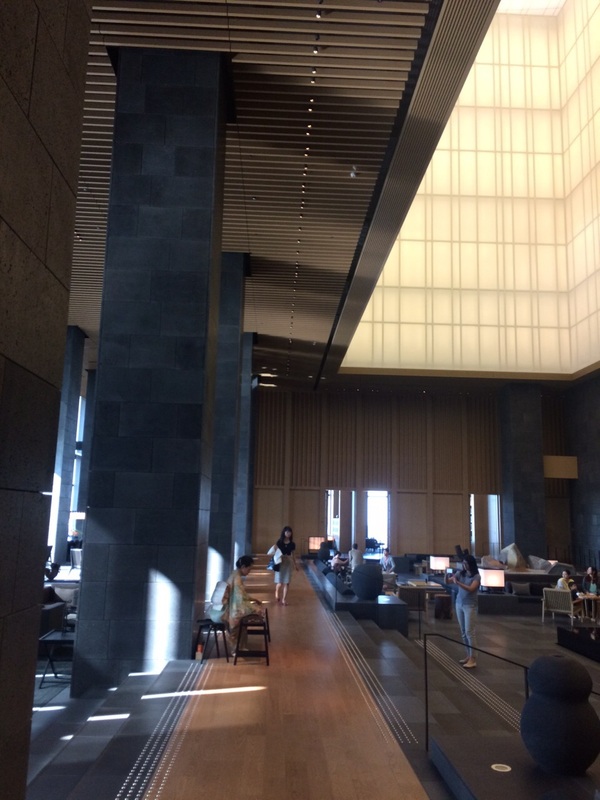 The dark grey granite, that I had found so ominous in the lobby, was softened by light warm oak cladding and the textures of shoji and tatami. Aman redemption! So the final verdict, I enjoyed my stay, but would I return? My favourite hotel in Tokyo remains the Mandarin Oriental. Few hotels can compete with the view of Mount Fuji from the lobby and if I do find myself at the Marunouchi North exit of Tokyo station, I would stop at the Maranuch. I have just designed a new armchair for my family room and I absolutely love it! I wanted to create the ultimate relaxing chair. I have made it with quite a deep recline and I have paired it with a coordinating footstool, so I can really lay back and put my feet up. This is where I like to sit and read a magazine with a nice cup of coffee at the end of the day, a little bit of light music…..heaven!! 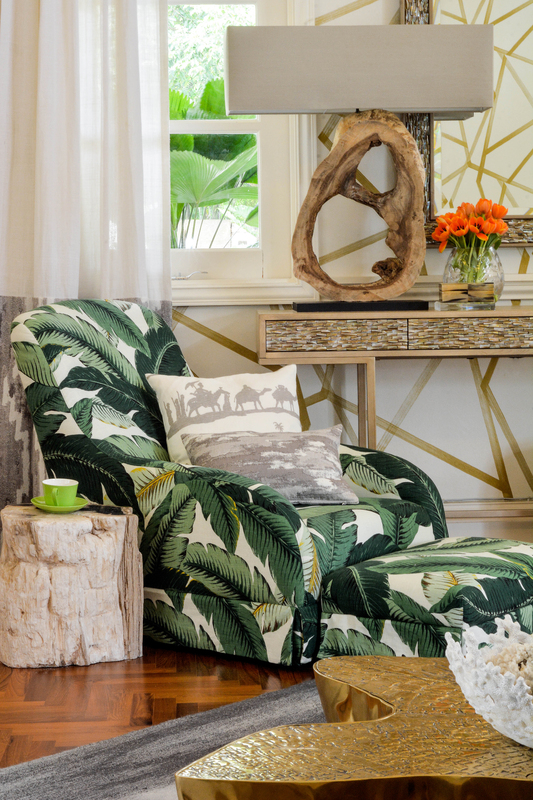 I chose a striking large leaf-print fabric and cut the fabric so that it has the look of a loose slip cover. This gives it an unstructured look which emphasizes the easy going vibe. This is a chair that is fresh and fun with a touch of humour. It welcomes me every day, inviting me to kick of my shoes and simply chill! It is just like being welcomed home by a good old friend. It’s no secret that I am a big fan of animal print. You just need to check out my profile picture to see my penchant for these patterns. I love to add a touch of animal to my wardrobe and I use it in many of my design projects too. It has always struck me as paradoxical how something so totally natural could look so utterly glamorous! One of my favourite ways to use animal print is as a rug. 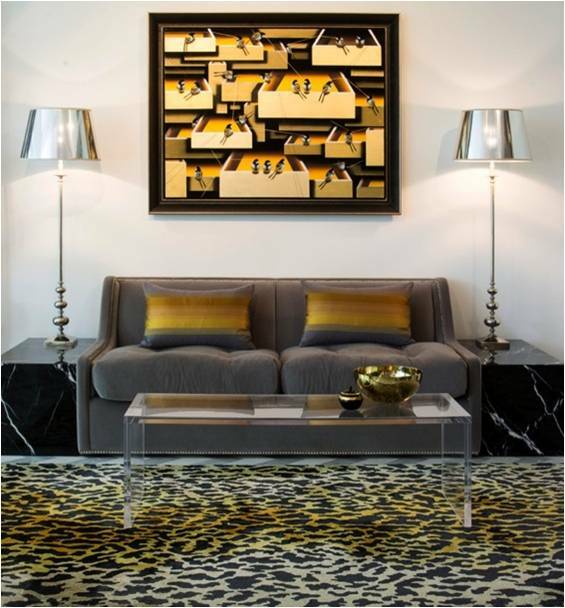 I designed a leopard print rug a few years ago for a client that wanted to add a touch of luxe to an expansive walk-in closet and it certainly did just that. Since then, we have been using this rug pattern in several projects and it has become one of our most popular rug designs. 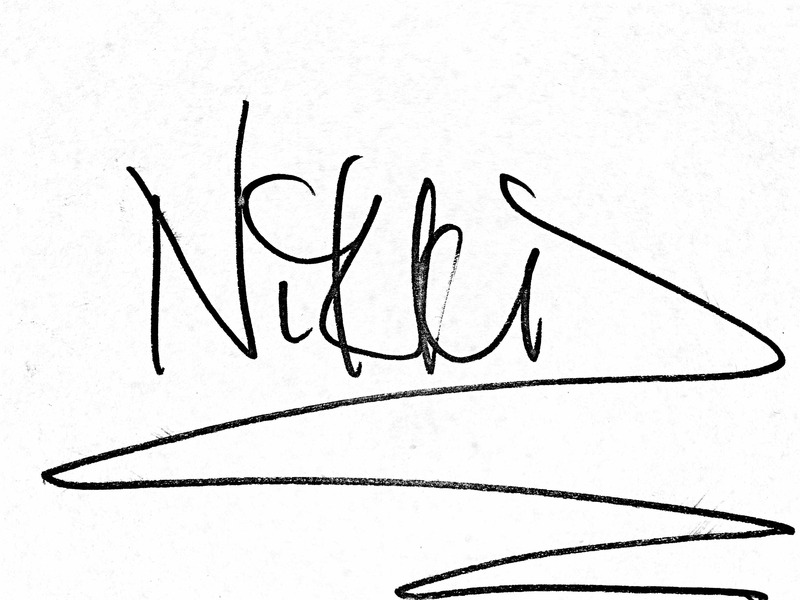 So much so that we have decided to include it in our DIID signature series. 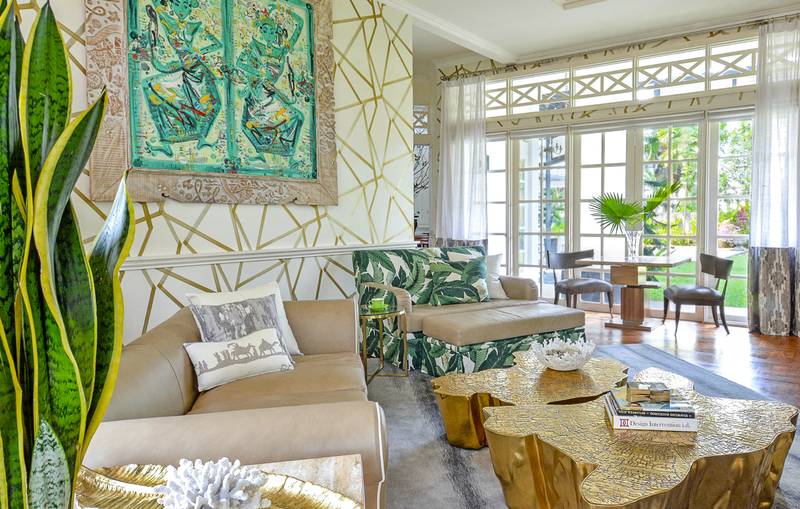 Doesn’t it look fabulous in this glamorous space? But it it can also look calm and understated as done in this colonial style study. 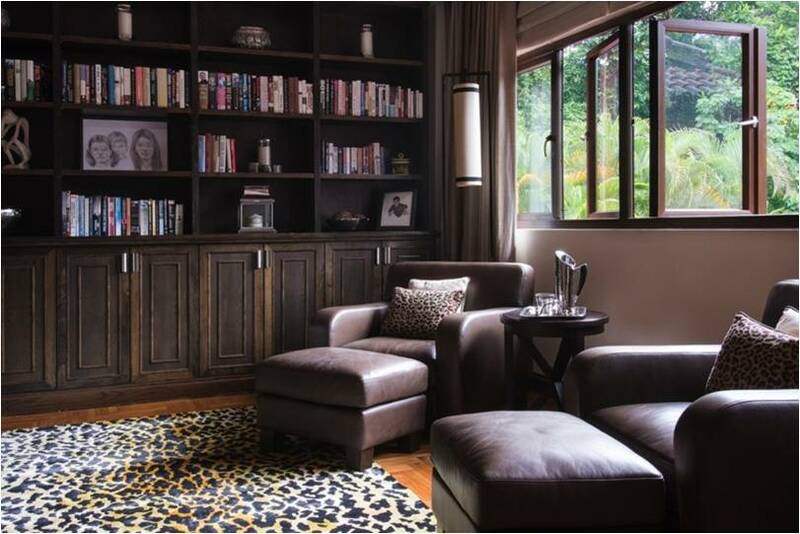 The rug just adds enough pattern to keep the room interesting without over complicating the relaxed vibe of the room. But have you ever considered mixing your animal patterns? 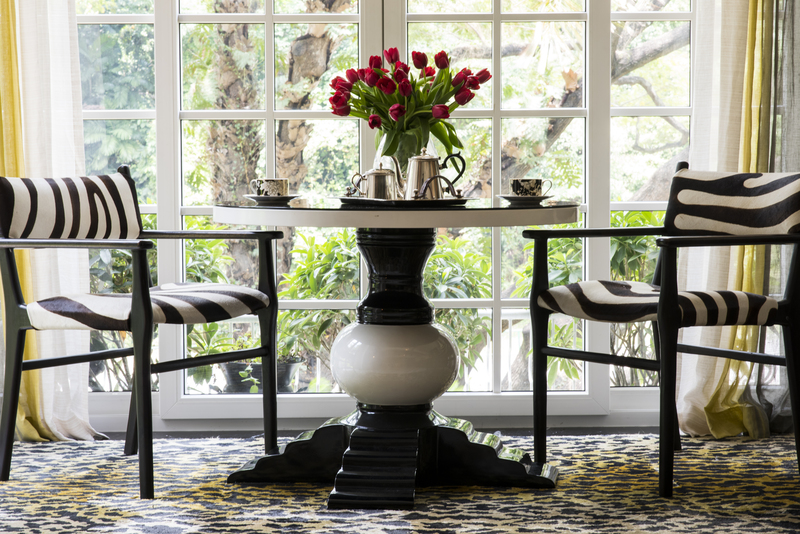 Check out how the tones in the rug warm the stark black and white combination. And when the sun streams in through the window, it almost feels like the rug is illuminating the room, casting a soft glow throughout the space–a perfect place for that breakfast coffee. 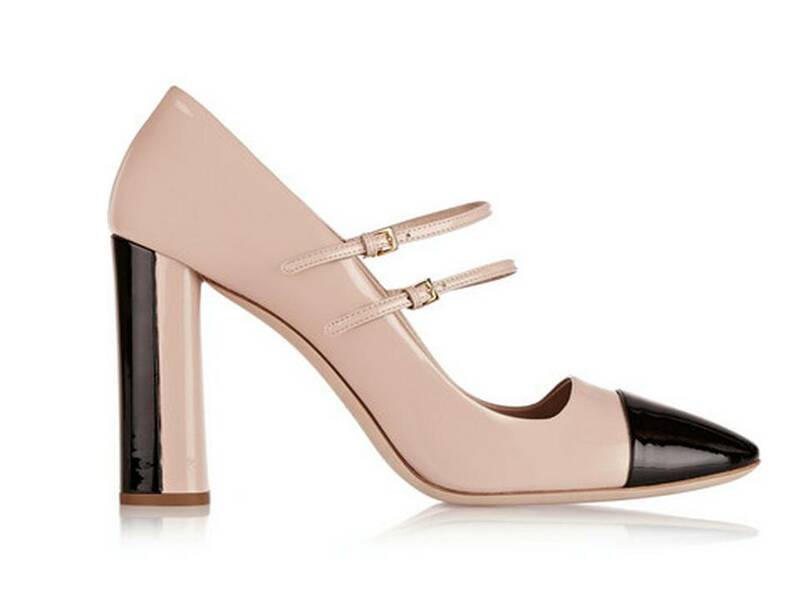 Aren’t these shoes by Miu Miu simply delightful? It is just that perfect shade of pink that is oh so flattering and not at all sugary sweet. This is a sophisticated pink that is full of serenity. It is so serene it could be used as a neutral, just like a taupe but with more warmth. I love it! I like how they have complemented it with black glossy highlights. I would use it as a wall color with black gloss skirting boards, with a soft grey velvet sofa and a black and white marble floor. Divine! We put these fabrics together to show how well these colors coordinate in design. 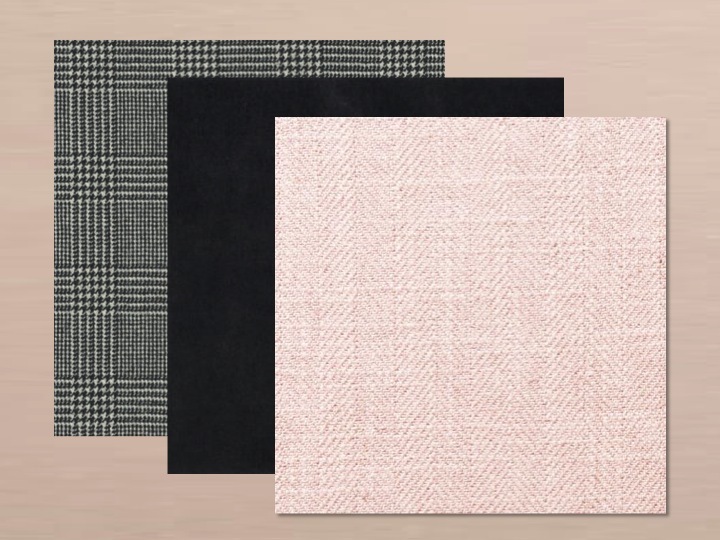 Fabric swatches from left to right: Ralph Lauren Hathaway Glen Plaid, Designers Guild Varese Black, Clarke & Clarke Henley Rose. Far right paint swatch is powder puff pink by Dulux.